Zollipops® are not ordinary lollipops. 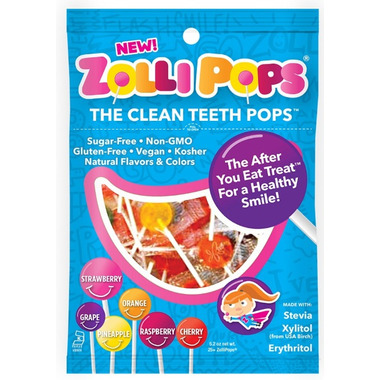 Zollipops are supercharged with Xylitol, Erythritol, Stevia and other smile friendly natural ingredients. Zollipops® are the “After You Eat Treat™”. 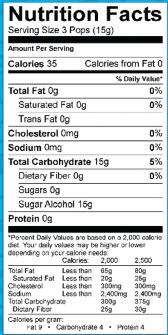 Enjoy one after every meal or sugary snack. 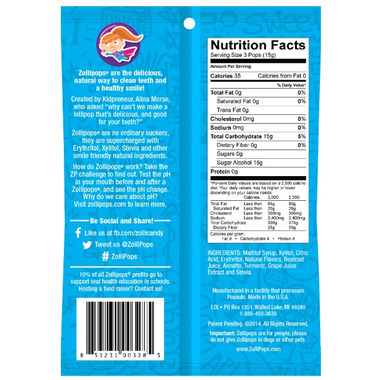 Each pack comes in a resealable pouch: Pack Zollipops® for lunches or picnics, or have as a healthy treat anytime. This will be our 3rd time buying this product. My kids (2 and 6) love them and don't even notice a difference from conventional lollipop. I can feel good giving them this treat without worrying about sugar and cavities. Great flavours, natural colours and perfect sweetness. I recommend! We love these at our house. My 4 year old enjoys them and I donâ€™t feel horrible letting her have them. They taste good and not too sweet. My son is eating it, he liked it. I was surprised though by the size, itâ€™s very very small lollipop. He must eat 3 to be as Dr Jones loolipops size for example, very tinny. Love everything about them, but the price. This produce is the first time using it. Taste great. This product came recommended by my dental hygienist. Great alternative to sugar candy, but even better the xylitol neutralizes the ph in the mouth and contributes to a healthier smile :)my kids love the taste and flavour... no problem with stick or wrappers here.my only complaint ... A little pricey...but comparable to other xylitol products. This product exceeded my expectations. I love that they are Gluten Free, Peanut Free and Free from Artificial Dyes. And they taste great!!! Loved the idea of these, but was disappointed with how many were missing sticks and or wrappers from the unopened bag. They were very gummy. I was expecting them here be more of a hard candy like other lollipops.The sticks come off if you look at them wrong, and so you have kid open them very carefully. The wrapper splits into little pieces that I had to pick of the candy before giving it to the kids, although they did like the taste. None of the candy in the bag were round. Looked like they could have been melted, but this is the first time I have tried this so not sure if they always look this way or not. Will stay with other brands. This definitely is not worth the price, even being sugar free. Amazing! My kids love them and I love there's no nasty food dyes. They come off the stick fairly easily so open carefully. I will keep buying these!